More Americans than forecast filed applications for unemployment benefits last week and consumer confidence declined by the most in a year, signaling that a cooling labor market may restrain household spending. 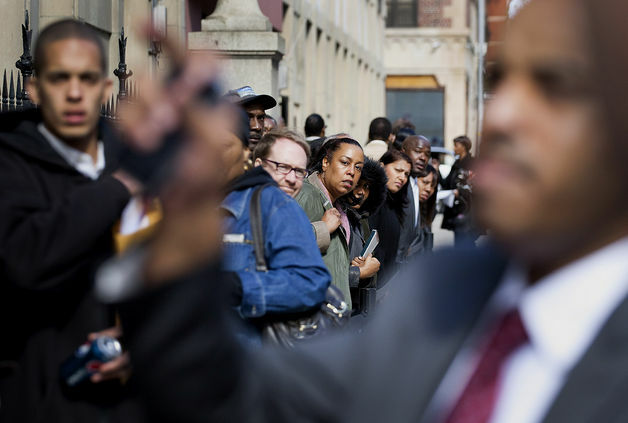 Jobless claims fell to 388,000 from a revised 389,000 the prior week that was the highest since early January, Labor Department figures showed today in Washington. The Bloomberg Consumer Comfort Index declined to minus 35.8 from minus 31.4 the previous week. Fewer firings are needed to lay the groundwork for more hiring and support consumer demand, which makes up 70 percent of the economy. Another report today showed that signed contracts to buy homes rose more than forecast in March, more evidence of a stabilizing housing market that may boost confidence. Stocks climbed for a third day after the housing data and as technology companies rallied on better-than-estimated earnings. The Standard & Poor’s 500 Index (SPX) rose 0.7 percent to 1,399.98 at the close of trading in in New York. The yield on the benchmark 10-year Treasury note fell to 1.94 percent at 4:21 p.m. from 1.98 percent late yesterday. Confidence is also slipping in the euro region, a report today showed. An index of executive and consumer sentiment in the 17- nation euro area fell to 92.8 from a revised 94.5 in March, the European Commission in Brussels said today. Economists had forecast a drop to 94.2 from a previously reported 94.4, the median of 29 estimates in a Bloomberg News survey showed. U.S. jobless claims were forecast to decline to 375,000, according to the median of 48 estimates in a Bloomberg News survey of economists. The Labor Department revised the previous week’s figure from 386,000. Claims in the week ended April 14 were the highest since Jan. 7. Among companies cutting positions is AMR Corp. (AAMRQ)’s American Airlines, which said last week it will eliminate 1,200 airport agent, baggage and cargo jobs. The cuts come as part of a bankruptcy restructuring plan to trim annual labor spending by $1.25 billion. CSX Corp. (CSX), the biggest U.S. eastern railroad, is hiring people mainly to keep headcount stable. A report from the Labor Department on April 6 showed hiring cooled in March. Employers added 120,000 jobs, the fewest in five months. The jobless rate fell to 8.2 percent from 8.3 percent the prior month. Slower job growth may weigh on consumer moods. The Bloomberg comfort data showed the buying climate index decreased to minus 41.5 last week from minus 36.8 the prior week. A measure of Americans’ views of the state of the economy dropped to minus 66.4 from minus 64.3, and a gauge of personal finances slid to 0.4 from 6.8 the prior week. Men and young Americans, those from 18 to 34 years old, showed the biggest declines in sentiment during the latest week. The gauge for men declined after reaching a four-year high the prior week. Sentiment among the young fell last week to the lowest level since January. Among independents, a key swing group during this year’s presidential election, the comfort gauge fell to a two-month low of minus 37.7 from minus 29 the prior week. The measure also worsened for Democrats while holding at the prior week’s level for Republicans. Jobs and the economy are a central theme in political sparring between President Barack Obama and Republican challenger Mitt Romney. Consumers may get a boost from today’s housing data, which added to evidence this week that the industry at the heart of the financial crisis is bottoming. New homes sold at an annual pace of 328,000 in March, up 7.5 percent from a year earlier, Commerce Department data showed. Values in 20 U.S. cities fell 3.5 percent in February, the smallest 12-month drop since February 2011, according to the S&P/Case-Shiller index. Signed contracts to buy previously owned properties jumped 4.1 percent in March to 101.4, the highest level since April 2010, today’s data from the National Association of Realtors showed. Pending home sales are considered a leading indicator of progress in real estate because they track contract signings. Purchases of existing homes are tabulated when a contract closes, typically a month or two later, and made up about 93 percent of the housing market last year. Compared with a year earlier, March pending home sales climbed 10.8 percent after a 14.9 percent surge in February. Two of four regions saw an increase in pending home sales from the prior month, led by an 8.7 percent jump in the West, while the South posted a 5.9 percent gain.